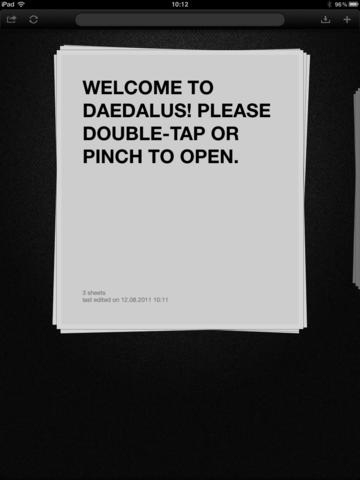 Daedalus Touch iPad App Review. You use your iPad daily to read the latest news, surf the Internet, download apps and games. But the iPad is so much more, magical or not. 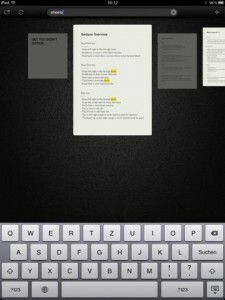 Whether you are a professional writer or not, Daedalus is the app that will make you enjoy writing on your iPad. If you’re into simplicity and minimalism, then Daedalus is the right choice for you. It may very well be the best choice on the iPad. 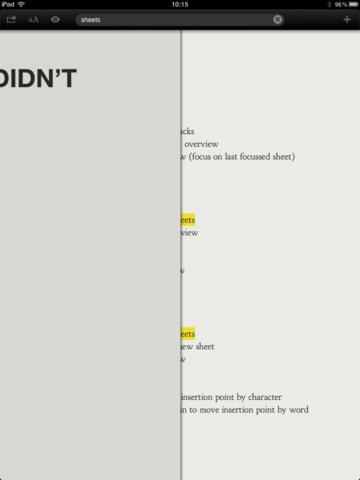 As I writer, I generally want a text editor that will not let its interface get in the way of my writing. I don’t want to feel that it’s there. Apple created a phenomenal way to read on the iPad and called it iBooks. The iPad was missing a phenomenal way to explore writing and I believe Daedalus has definitely brought it to life. The first thing you will notice with Daedalus is the lack of the complex technical aspects of other text editors. You have no rulers, no font options, no sheet margins and borders. When you’re writing, that’s exactly what you don’t need: distractions. Daedalus also introduces the concept of stacks. You won’t have any files or folders inside of this app. The term may be long gone, but I personally don’t see a big difference between stacks and folders. The idea is you can have an unlimited amount of stacks and inside each stach you can have an unlimited amount of sheets. A sheet can be as long as you need it to be. I failed to see the difference between stacks and folders. I can have as many folders as I want, and each folder can contain as many files as I want, right? A file (text document) is as long as I need it to be. Skipping this new naming convention, what I love about Daedalus is how easy it makes for adding new stacks and new sheets inside stacks. You can add a new stack by pressing the “+” button on the upper-right, which will create a new stack with two sheets of paper inside it. The first sheet contains the stack title. The second sheet is all yours. 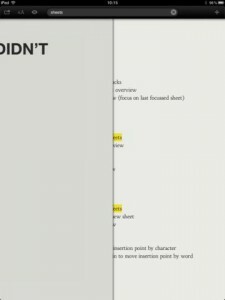 So start writing, and when it’s time to start a new sheet, simply swipe from right to left and that adds a new sheet to the stack. Naturally, you can do this as many times as you need. The overview of your entire document collection is just a pinch away. You can see all your stacks at a glance and pinch into them to select. You can reorder stacks and sheets with simple drag’n’drop gestures, select multiple sheets to export and share. Daedalus also syncs with Dropbox and MobileMe (at least until iCloud comes out), so all your work can be accessible from anywhere. And what’s more, your sheets can be shared with any other app that can read text documents or PDFs. Daedalus will do a simple word and character count as well and with its integrated browser you can always fact-check on Google or Wikipedia. With three sets of fonts, four background options, easy exporting, keeping track, editing and correcting of your files, Daedalus is the friendly text editor that puts the power of writing back in the users’ hands. The price is steep, but when you’re looking for quality, it’s best to put such thoughts to rest. It’s well worth it! 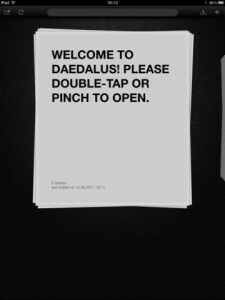 What do you think of Daedalus Touch ? Scroll down for our comment section and let us know!